The Freeland Chamber of Commerce had well over 50 member sites in its heyday. Visit the Forum to see who still drops by now and then. was the home to wild community chats and cold Freeze on tap. Find out who put Freeland together. Realbuys has a unique selection of Freeland souvenirs to help bring back the memories. Where to sleep, eat and have fun in Freeland. An Exposition of the diversity that was Freeland. A retrospective exhibit of Freeland's first big collaboration. Visit quaint Freeland Village for that olde timey feeling. The largest Miniature Golf Course in the SimWorld! Take home repros of our 2 Visitors Center locations. 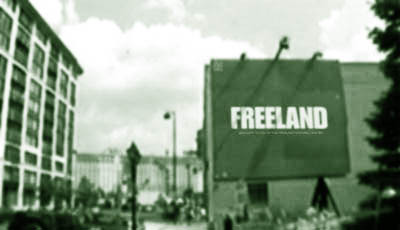 Freeland was formed in 2000 by a group of veteran SimCity Designers who were looking to build a home away from the official Maxis site to offer their custom works in an environment that mirrored the spirit of the game itself. Although the site grew and changed tremendously over the years, the underlying concept remained the same - Freeland was a collaboration of independent artists and designers who shared a similar philosophy about how to work together. We had no staff. We had no moderators or explicit heirarchy of any kind. We had very few rules and regulations as well. We did have respect and admiration for each other and our visitors though. We also had endless imagination and a ton of projects under our collective belts. But mostly we had fun. So whether it was working on one of our infamous collaborations or just chatting it up in Murphy's Pub, we kept things in perspective: We took great pride in what we made, but SimCity was just a game and in the end we were just fans trying to enjoy it a little more with our friends and visitors. And enjoy it we did. We hope you did too. Thanks for the memories and welcome to Freeland. Do you remember when the front page of Freeland for many months was just a picture linking you to the real index page? Or how about the "Freestyle" period when the page changed every 4th day and looked very little like a SimCity site?